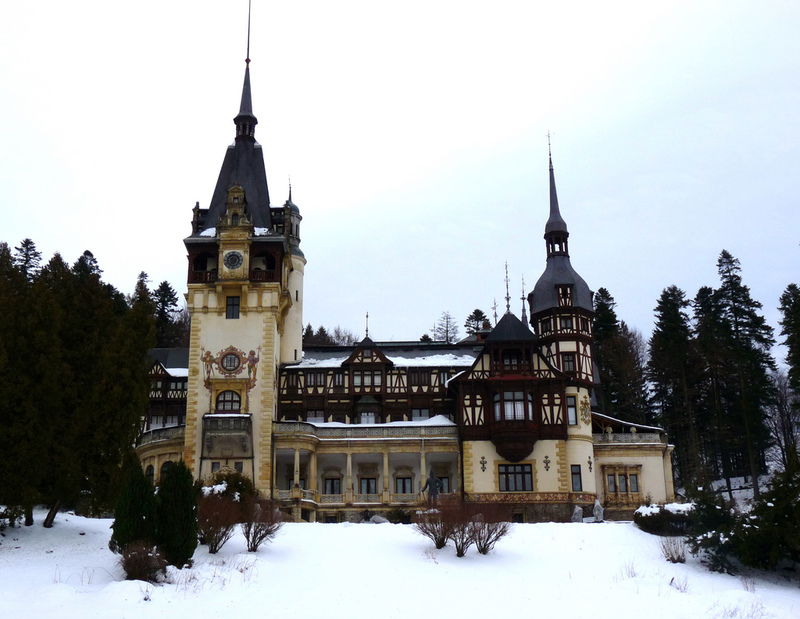 Peles Castle in Romania plays a leading role in "Princess for Christmas." Photo: Adam Shafer. It's undeniable that every time I see a movie filmed in Europe, I fall deeper in love with the continent—"Roman Holiday," "The Sound of Music," "Chocolat," "Under the Tuscan Sun," "Letters to Juliet," "Before Sunrise," "Midnight in Paris"—among hundreds of others, my wanderlust ignites and my longing to visit all of these places becomes insatiable. While I have traveled to many of the locations mentioned in the films above, there are a few that still elude me. One day, I plan to conquer all but for now, the visits are relegated to the stuff of dreams, at least for the moment anyway. Every holiday season, I look forward to watching the sappy Christmastime romance "A Princess for Christmas." Not only for the happily-ever-after ending, but to travel vicariously to a place I have long wanted to visit—Peles Castle in Romania at Christmastime. Not only is the story sweet and romantic, the visual romance is even more sublime—snowy landscapes, fairy-tale castles, Christmastime—combine them all and they make for an enchanting holiday movie. But before we explore this fairy-tale castle, let's revisit the movie. "A Princess for Christmas." Photo: WikiMedia.org. As the movie opens, we meet our protagonist, Jules Daly, played by Katie McGrath who is down on her luck after losing her job just before the holidays. Struggle ensues as she wonders what to do next knowing that she no longer has the financial means to care for her orphaned niece and nephew. That evening, a serendipitous invitation arrives at the front door in the form of Paisley Winterbottom, a butler who invites Jules and the kids to Castlebury, a fictional country near Lichtenstein; to visit the children's grandfather, Duke of Castlebury, played by Roger Moore. At first, she defiantly refuses to give into the notion of visiting the Duke who disowned his son and daughter-in-law, Jules' sister, because she was not of an acceptable pedigree. Eventually, Jules reluctantly agrees and off to Castlebury they go. Upon arrival, it's a frosty reception for Jules and the kids but soon, she rekindles the spirit of Christmas amid the darkness that's plagued the castle since the death of Jules' brother-in-law. Eventually, love conquers all—the love of Christmas, the love of family and the love of romance between Jules and the last surviving prince Ashton played by Sam Heughan. It's happily ever after for this young couple and the family reunited. Magnificent shot of Peles Castle in Romania. Photo: Sorin Mutu. "A Princess for Christmas" combines three locations to create the fictional Castlebury Hall but Peles Castle stars in the leading role. From the moment we pull up to the Alpine palace laden in snow, it's impossible not to fall under its enchantment with its whimsical façade, fanciful spires and ornate embellishments. 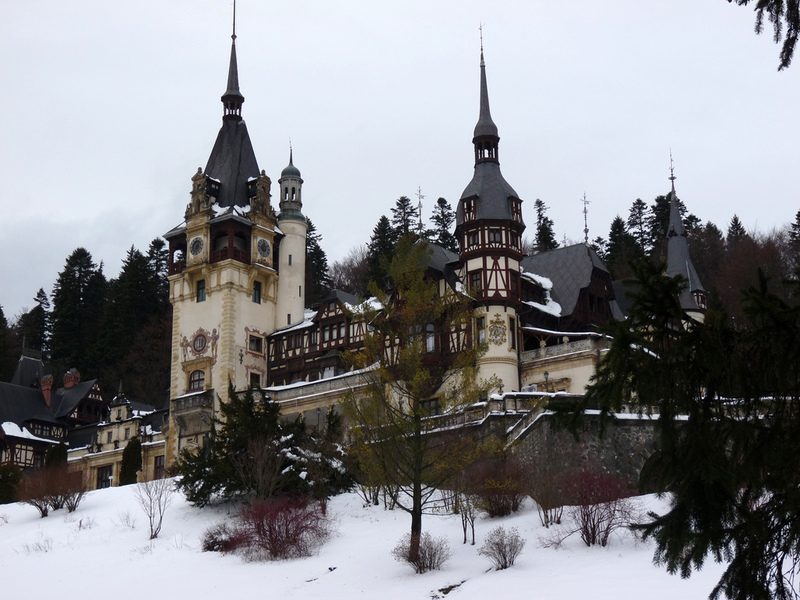 Peles Castle laden in snow. Photo: Rachel Titiriga. Nestled in the Carpathian Mountains near Sinaia, Romania; the Neo-Renaissance Peles Castle dates back to 1873 under the reign of King Carol I who first fell in love this mountainous countryside in 1866 and ordered the construction of his new hunting lodge and summer residence. 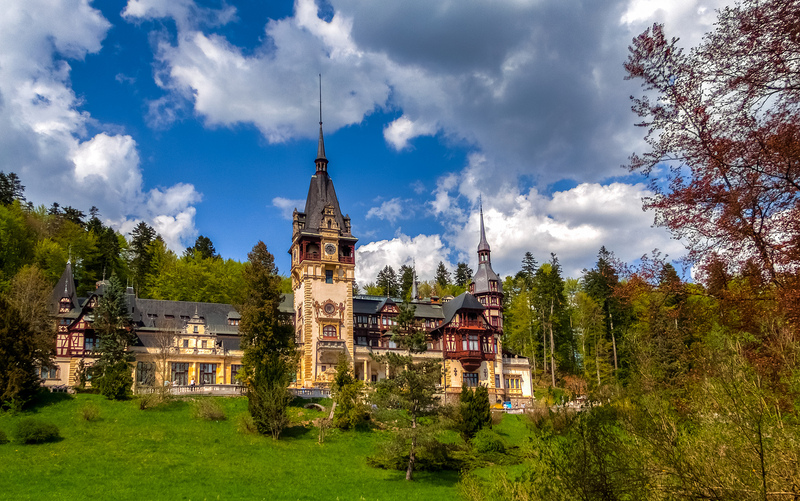 Amassing more than 500 square miles (1,300 square km) in 1872, the king officially named his new domain the Royal Estate of Sinaia. 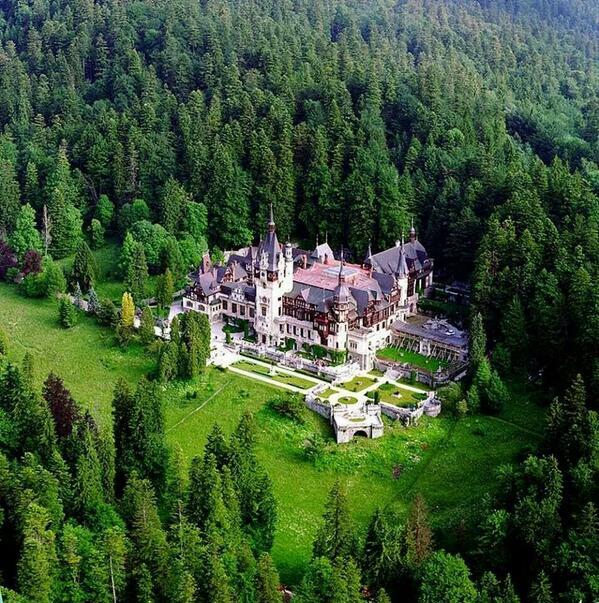 Aerial view of Peles Castle and the Royal Estate of Sinaia in Romania. Photo: WikiMedia.org. After rejecting three designs, Carol awarded the commission to a German architect, Johannes Schultz, who impressed His Majesty with his blended Renaissance designs inspired by classic styles of Italian and German origins, very much like Castle Neuschwanstein in Bavaria, a personal favorite. Various phases of construction followed until the completion of the main tower in 1914. Close-up view shows the castle's whimsical façade with its fanciful spires and ornate embellishments. Photo: Rachel Itiriga. The sprawling Peles Castle comprises 34,000 square feet with more than 170 rooms, including 30 bathrooms. Most of its Baroque-style interiors feature highly ornate woodwork and elaborately sophisticated tapestries. Of particular interest are the various art collections than span the last four centuries—sculpture, paintings, stained glass, ivory, china, not to mention an exquisite 1,400-piece collection of armory. 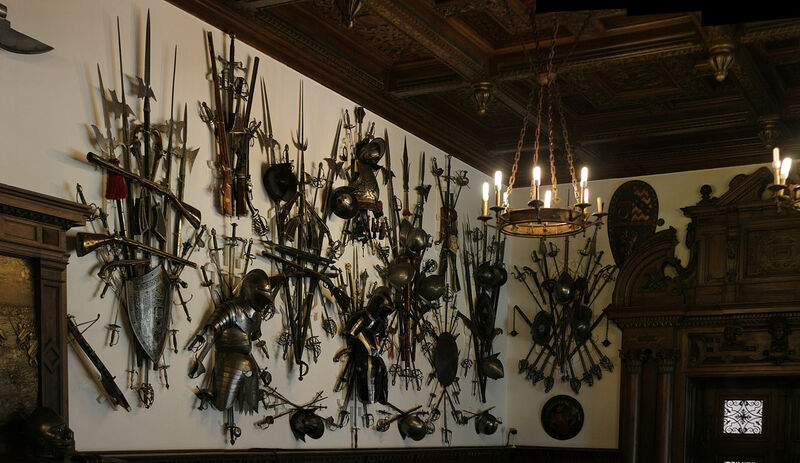 The astounding 1,400-piece armory collection inside the castle. Photo: WikiMedia.org. 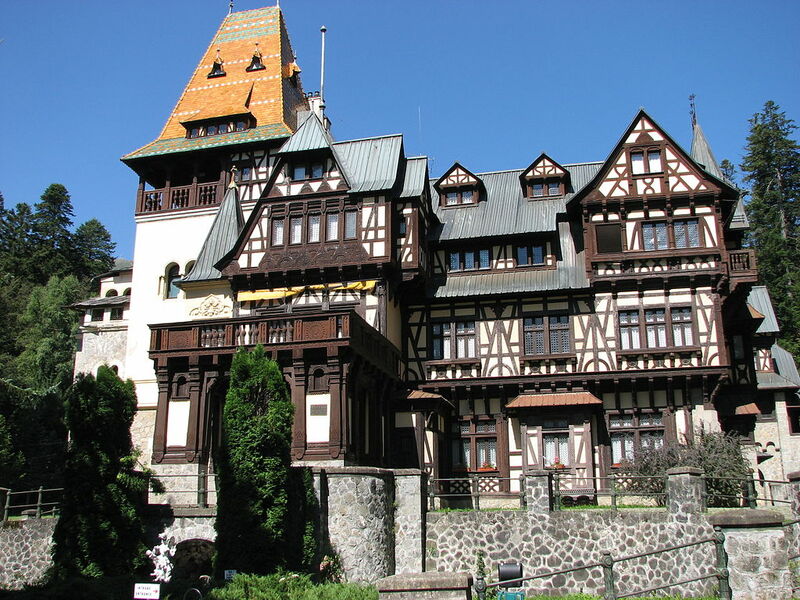 When the monarchy was forced to abdicate the throne at the hands of the Communist Party of Romania in 1947, the regime seized the estate including Peles Castle and the nearby Pelişor Chateau, a separate building completed in 1902 and intended to be the residence of the Carol's nephew, the future King Ferdinand. The castle opened as a museum in 1953; closed from 1975-1990 during the last years of the Communist regime; and finally in 1989 during the Revolution, Peles and Pelişor were designated heritage sites and opened to the public. Additional fee for the use of photography. Visit Peles.ro for more information and pricing. The nearby Pelisor Castle was originally intended to be the residence of the future King Ferdinand, King Carol I's nephew. Photo: WikiMedia.org. Tour includes all floors of the castle. Known as the fictional village of Lansquenet-sous-Tannes, Flavigny-sur-Ozerain in Burgundy, France, is the heart of yet another of my favorite European-filmed movies, "Chocolat." The film opens on a cold winter's night when we meet two red-cloaked travelers; our protagonist Vianne, played by Juliette Binoche, and her daughter Anouk who travel from village to village forever yielding to North Wind, to share their ancient Mayan chocolate recipes. However, it's a frosty reception for our two leading ladies— especially during Lent. Soon after renting a vacant store from Armande, played by Judi Dench, Vianne begins to set up her chocolaterie when she encounters the Comte or Count Paul de Reynauld who rules the villagers with an iron religious fist. Perfectly cast and played by Alfred Molina, our Comte learns of Vianne's intentions and plans to shut her down before she serves her first decadent confection. It's easy to imagine Vianne's sign swinging over the doorway of this now vacant shop. Photo: WikiMedia.org. When the shop opens soon thereafter, it appears the Count's objective to conquer the chocolaterie is coming to pass when none of the villagers venture inside the shop lest the mighty wrath of the Count—a price too high to pay for sweet indulgences. But slowly, one by one, the allure of milk chocolate proves to be too rich and they succumb to the tantalizing Mayan seduction. Adding fuel to the fire, Vianne befriends a floating band of Gypsies who arrive in town and typically shunned by the Count and villagers. Romance blooms between Vianne and Roux played by Johnny Depp. Needless to say, the Count is even more enraged. You can see the now-vacant store in the facades at the left. Photo: WikiMedia.org. When all hope seems lost and the calling of the North Wind can't be ignored any longer, Vianne packs up and plans to leave when suddenly she hears clanging pots and pans coming from her kitchen. As she opens the door, the villagers are hard at work on the preparations for the next day's Easter Sunday festival. Realizing now that she is loved by her new friends, Vianne decides to stay. Yet, the Count does not rest. Later that night and still obsessed with disrupting Vianne's business, he breaks into the chocolaterie shop and sets out to destroy the Easter confections. While doing so, a tiny fleck of chocolate lands on his lip—the ultimate test of "lead us not into temptation." But into temptation he dives, literally, into the chocolate confections and indulges to the point of exhaustion. He passes out. The next morning, he's awakened, much to his horror, by Vianne who offers a fizzing drink to settle his stomach. She promises not to tell a soul and from that moment, the two become friends. Roux returns, it's happily ever after, and the call of the North Wind is ignored. Flavigny-sur-Ozerain seems to float in the hills of Burgundy. Photo: Daniel Jolivet. 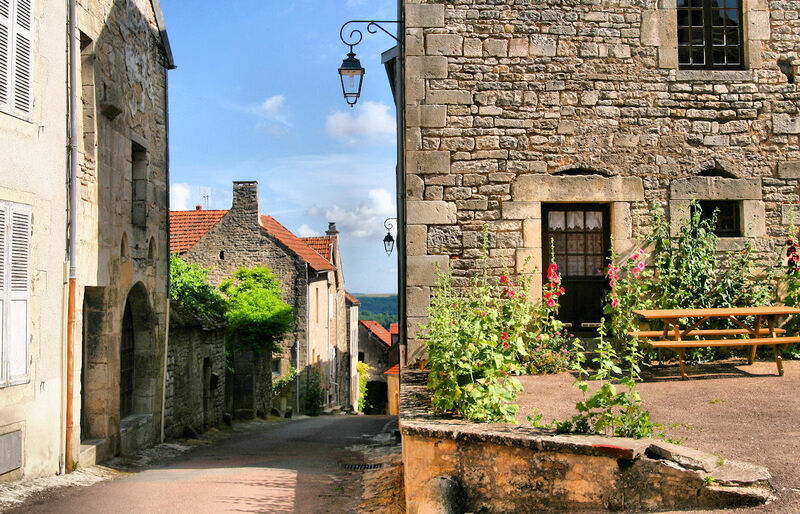 Dubbed as "one of the most beautiful villages in France," Flavigny-sur-Ozerain is located in the Burgundy region. Dating back to 52 B.C. when it was known as Flaviniacum, Flavigny-sur-Ozerain was named after Flavinius, a Roman general who received the land as a gift from Caesar. Centuries passed and Saint-Pierre (Saint Peter) de Flavigny Abbey, the village's first and today's main attraction, was founded during the reign of Clovis (465-511). However, most of what we see today dates back to 719 when Widerard established the village's first monastic community. But what put Flavigny on the map occurred during the Viking raids in the 9th century when the relics of Saint Reine (Regina) were moved to the fortified abbey in 827, thus establishing the abbey as a pilgrimage site. It was because of those pilgrims en route to Santiago de Compostella (Spain), that the abbey continued to grow and prosper and by the 10th century, a village was born. 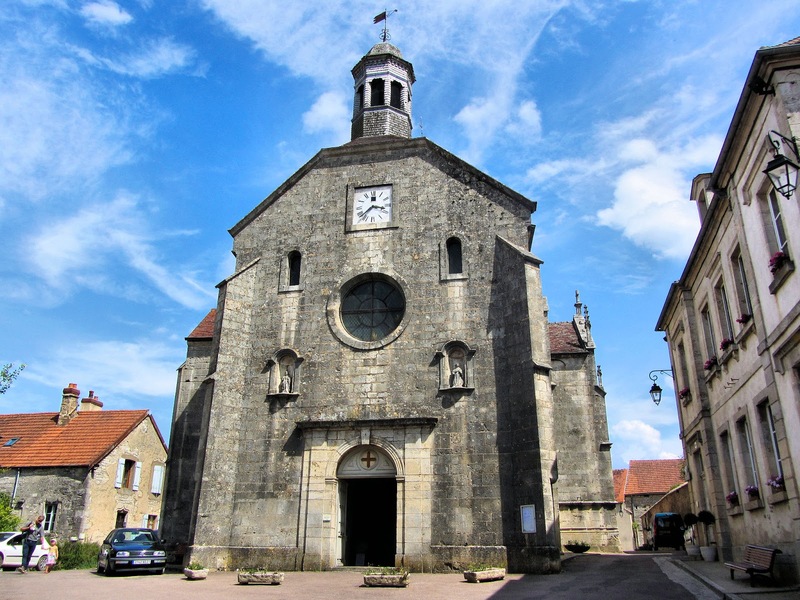 A second church was added in the 13th century, the parish church of Saint-Genest, and who would have thought back then that this church would have a leading role a 21st-century film. 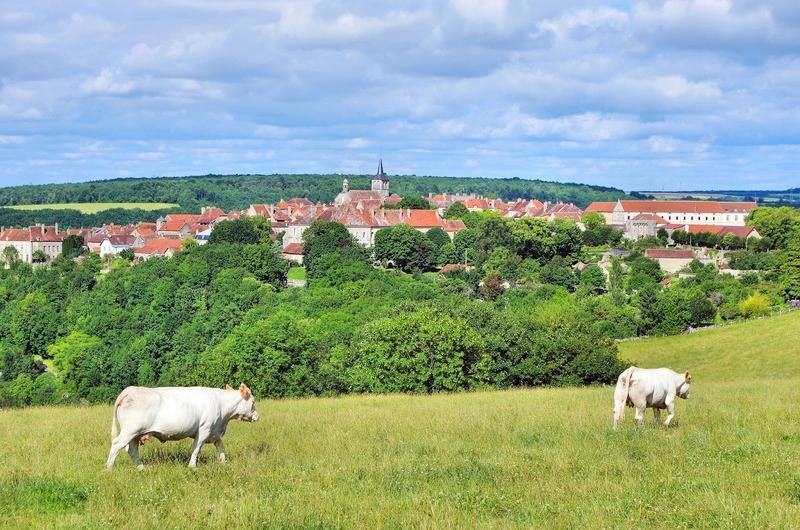 There is one other sweet reason to visit Flavigny, its renowned confection Anis de Flavigny—round white pearls of candied aniseed covered in a flavored sugary coating. Still produced in the abbey to this day, and by hand just as the monks had done back in the 8th century. 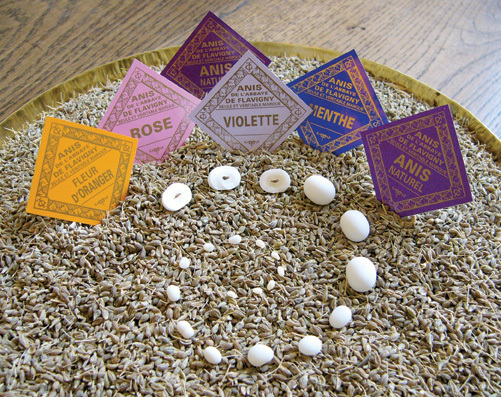 The renowned Anis-de-Flavigny is still made by hand just like the monks of the 8th century. Photo: WikiMedia.org. Today, the village is home to about 400 residents many of whom are artists and artisans. Although "Chocolat" continues to drive tourists here, the village remains unspoiled—a wonderful place to journey back in time! Anis-de-Flavigny factory at the Flavigny-sur-Ozerain Abbey. Photo: WikiMedia.org. Not only the site of the formidable abbey, the building houses the Anis de Flavigny factory as well. Visit the factory from February through November, sans August, from 9 – 11 a.m. only, so plan to rise early for these tasty confections. And beneath it all, the pre-Romanesque Carolingian crypts only recently discovered in 1956. 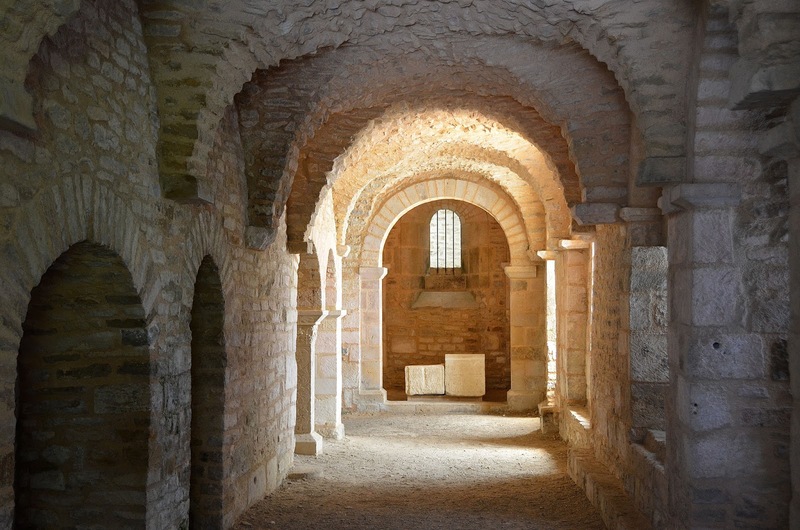 Carolingian Crypts at the Saint-Pierre Abbey. Photo: Patrick. If you're visiting the area at the end of October, be sure to stop by on the 28th for Saint Simon's Fair, a festival celebrated in the village that commemorates the dedication of Saint Peter's at the Abbey in 878. Front facade of the Church of Saint-Genest. Photo: Patrick. Dedicated in the 13th century, this medieval church has whimsical carved stalls lining its nave. Plus, a 12th-century wooden Madonna. Note that the church is not open but a few hours in the afternoons so plan accordingly. 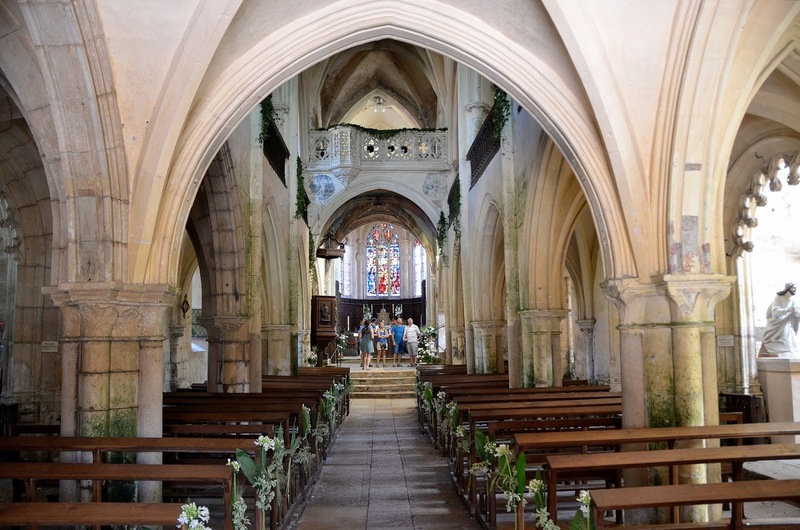 Interior view of the Church of Saint-Genest. Photo: Patrick. 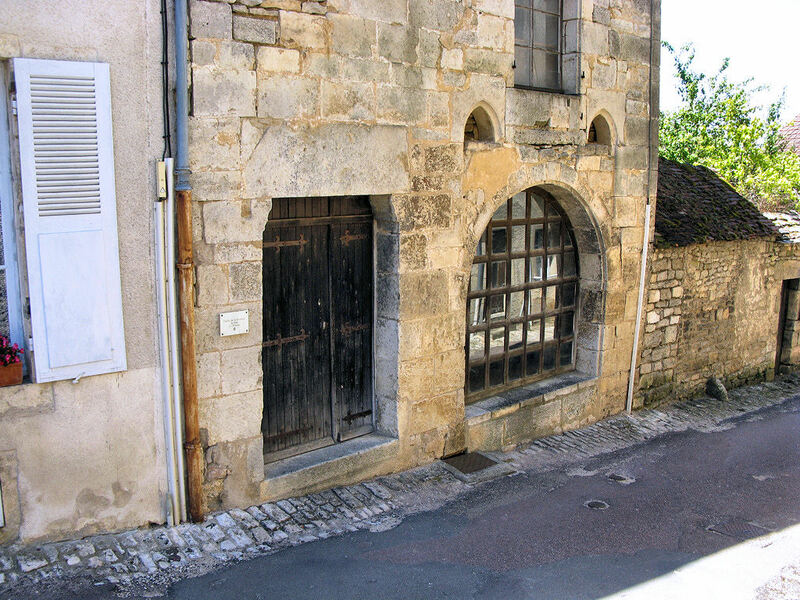 Other Flavigny-sur-Ozerain sights include Maison du Donataire with its intriguing Madonna sculpture on the façade; Saint Joseph's Monastery; and the Porte du Bourg for a twilight stroll. A most intriguing sculpture of the Madonna decorates the facade of the Maison du Donataire in Flavigny-sur-Ozerain. Photo: WikiMedia.org. Benvenuti a Verona. Photo: Jong-Lantink. Without a doubt, one of my absolute favorite European-filmed movies is "Letters to Juliet," a modern-day romance about true love and sacrifice. Where else could a movie about love be filmed but in Juliet's hometown of Verona, Italy. But this 21st-century twist of the classic has us following the quests of not one but two Juliets who find their Romeos despite the obstacles along the way. For one, it's love rekindled after 50 years, for the other, she didn't even know she was looking. Amanda Seyfried is 'Sophie' in "Letters to Juliet." Photo: WikiMedia.org. Once there, Sophie learns of the tradition of young girls who come to write letters to Juliet seeking her romantic advice and guidance. Soon after, she meets the “Secretaries of Juliet,” a group of women who respond to all the letters left behind. One evening while gathering up the letters with the secretaries, Sophie uncovers one tucked inside a stone wall for 50 years. As it turns out, it was written by a desperate young woman of 16 years, Claire, played by the incomparable Vanessa Redgrave, who explained of her love for Lorenzo and how she had to leave him waiting for her in Tuscany. Of course, Sophie replies and soon thereafter, meets her face to face. Escorted by her reluctant grandson Charlie, Chris Egan, Claire and Sophie set out on a quest to find Claire’s long lost Lorenzo. 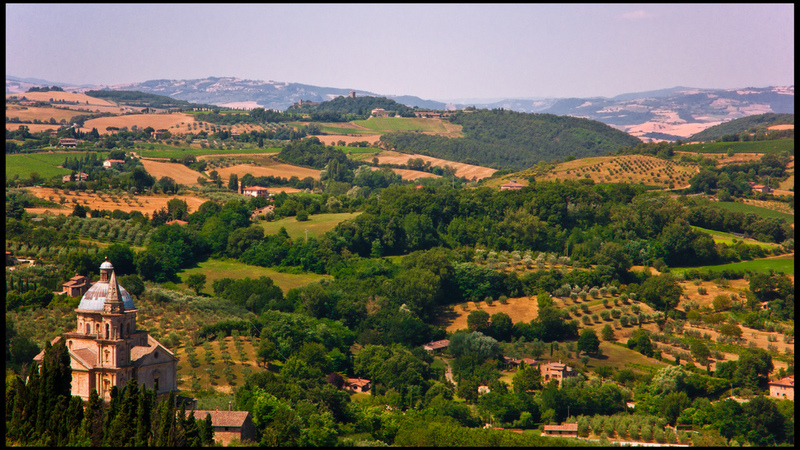 Soon we are driving through Tuscany, one setting after the next woos us with the visual romance of the landscape as well as the memories of Claire and Lorenzo's love. Unexpectedly, romance also blooms between Sophie and Charlie despite their initial dislike for each other. Once again, when all hope appears lost, a serendipitous detour on the way to the airport reunites Claire with her Lorenzo after 50 years and it’s happily ever after for all including Sophie and Charlie. 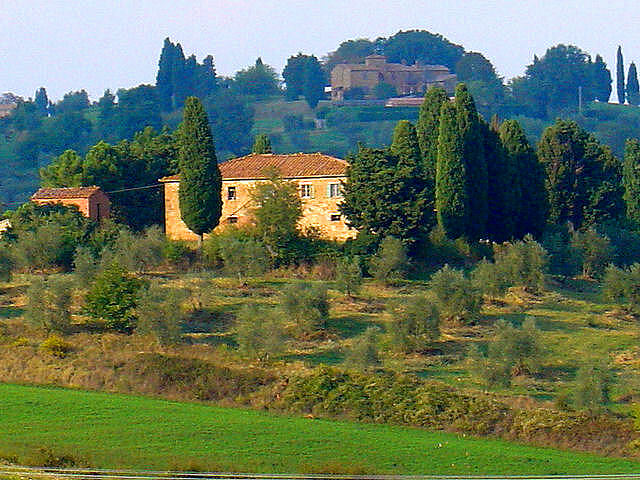 Visual romance of Tuscany. Photo: EuroTravelogue™. Unauthorized use is prohibited. 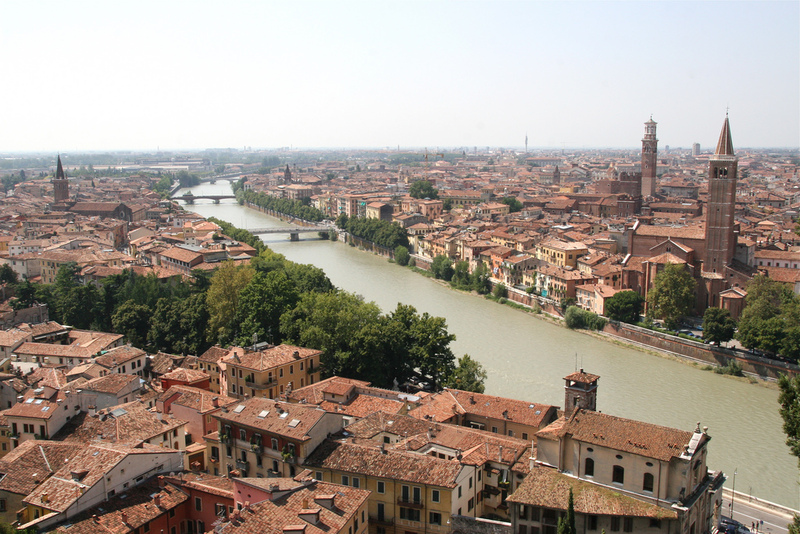 What to see and do in Verona? Check out my latest post "Verona – a cultural discovery" and be sure to follow along on all the networks starting 8 October. Please tell me about your favorite movies filmed in Europe and about the places you long to visit. I think you were born on the wrong continent Jeff. What a delicious set of photos. I wish Europe was easier to access - for short periods, because I always feel like you need a trip of at least 2 weeks to do it justice. Who knows when I'll next get there but would love to visit every place you described in this post. Hi there Leigh! I couldn't agree with you more my friend! Ever since my first visit, I've been addicted, enchanted and positively fell in love with all of the places I visited. And then I wanted to move to each of them too! And so my mission continues, seek out and discover Europe. Thank you so much for stopping by and sharing your thoughts!! I love European travel and love movies, so ... I love this post. 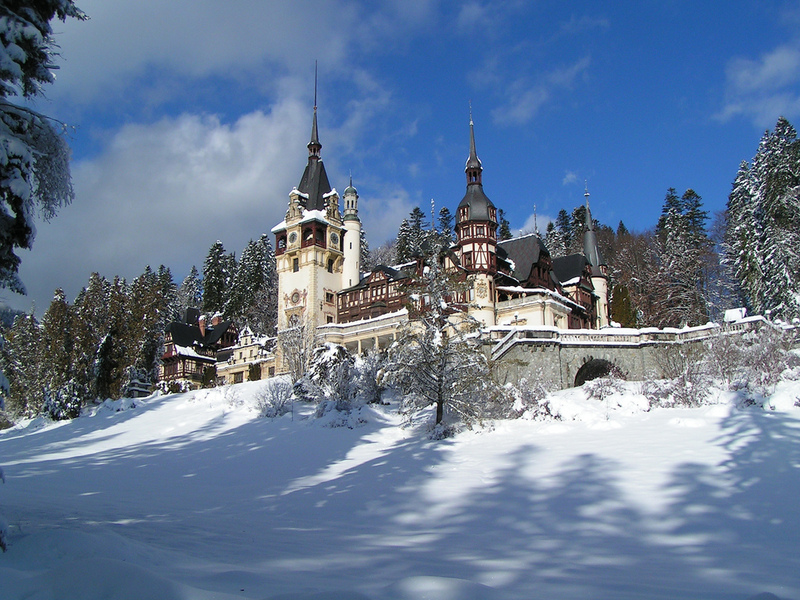 I've never seen A Princess for Christmas, but hope that a visit to Peles Castle is in my future. You mentioned Midnight in Paris -- great film. Another favorite Woody Allen movie filmed in Europe is Vicky Cristina Barcelona -- had to get to that city after seeing the film. Ah, there are so many good ones. The Bourne flicks have lots of great European scenes. Ciao bella!! Grazie mille for stopping by! All great movies...make me want to visit Europe over and over and over again!! Hi there Heather! Thanks so much for stopping by to share your thoughts!! I love them all!! 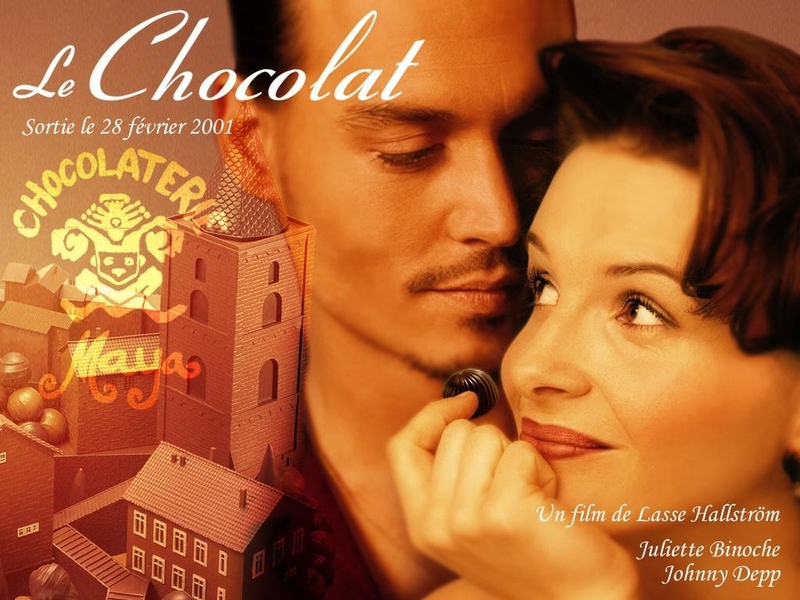 Love Chocolat, I've seen it many times. Thought perhaps it was set in Provence, but now I've a reason to visit Bourgogne. Haven't seen (or even heard of) Letters to Juliet, but Vanessa Redgrave is fabulous; putting it on my list. Wonderful article, Jeff. Hi there Sophie! Yes, if you're a romantic at heart, please make sure you see "Letters to Juliet"! It's fabulous!!! Haven't seen any of those movies, so I think I just got a nice weekend plan! Although yeah, it'd be way better to see them in their respective countries. Okay Lily, then it's time you watch them all! I think you'll be pleased! Thanks so much for stopping by! I have seen all these fantastic movies and also visited most of these beautiful places. I never heard however of the movie "A Princess for Christmas", the first part of the story reminds me a bit of the movie "Little Lord Fauntleroy". I also have never been to Romania, Peles Castle looks absolutely enchanting, so beautiful. Ciao Freya! Peles continues to be a dream of mine and so I must get there soon. Thank you so much for stopping by and sharing your thoughts! 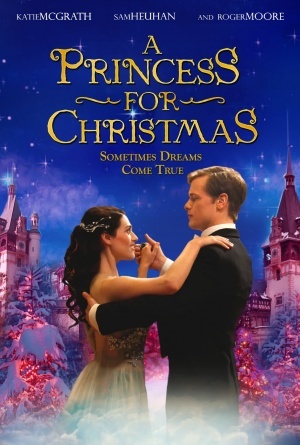 Princess for Christmas is a sappy little movie, but fun nonetheless! Wonderful article, Jeff. I loved every word and every picture. 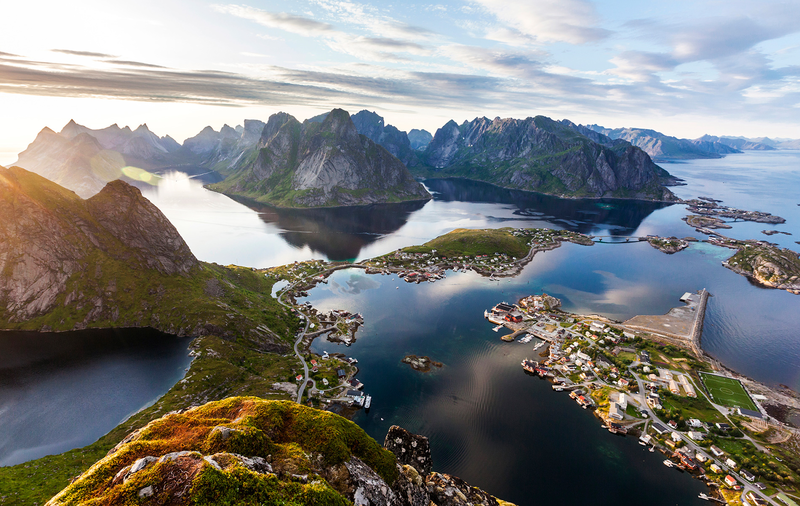 There are simply so many beautiful places in this world and simply not enough time to visit them all - but being able to read about them and see your lovely photos is of some solace! 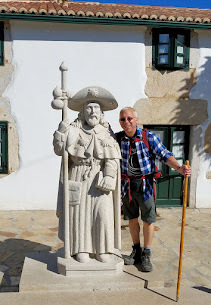 I can also completely understand how the movies have inspired you to travel - I truly believe New Jetsetters would not exist if both Steve and I had not been mesmerized by the scenery of the James Bond movies while we were growing up, LOL! Take care and keep on sharing your talents with us, my good friend. Hi Deb and thank you so much for stopping by and for your kind words! I really appreciate it! I couldn't agree with you more about so many places to visit, I just hope I can see half of what's on my ever-changing bucket list! Thanks again! I've just finished watching The Hundred Foot Journey, filmed in France, and absolutely loved it. Beautiful photography, lovely story and a great movie for food-lovers. Hi there Christine! Oh how I want to read the book and see the movie as well! I bet it's wonderful! Thank you so much for stopping by to share your thoughts! 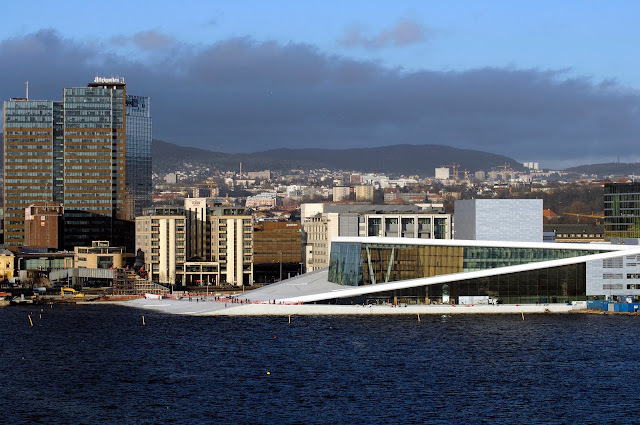 I love pariing movies with some of my favorite travel destinations. It's like I would travel to a country or a city without even leaving my home. I saw most of the movies on your list. Soe of them were good, some of them were "blah", but the locations were beautiful. I was disappointed about A Princess for Christmas, because the story was not original at all, but I'm glad they filmed it at the Peles Castle, because it's one of the most beautiful castles in Romania, my country. Hi Luminita! I couldn't agree with you more! Just think of all the movies out there that inspire wondrous journeys! I had to laugh when I read your comment about Princess, you're right on all accounts and its location is the only reason I watch the film ... but I have to admit, I am a sucker for happy endings! Thanks so much for stopping by and sharing your thoughts! I really appreciate it!